Report finds police officers killed on duty spiked in 2014. 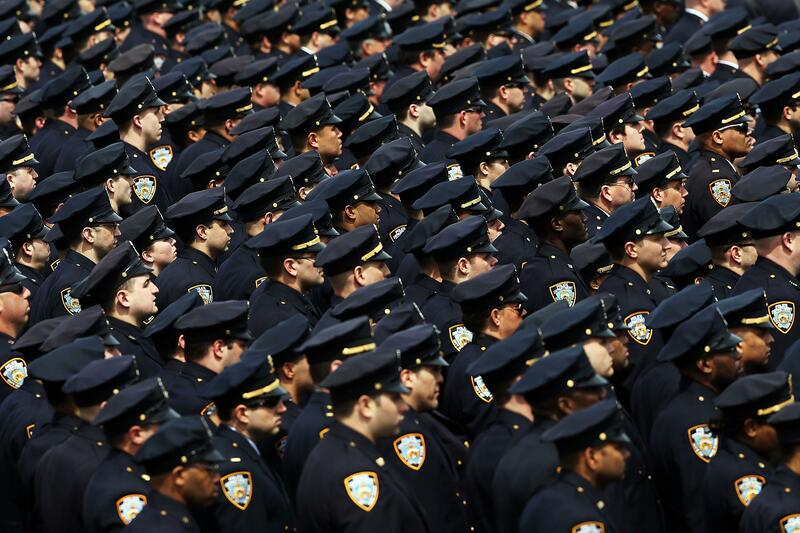 Thousands of police officers stand at attention at a funeral in Queens in April 2014. This year was a particularly deadly year for police officers, according to a report released on Tuesday by the National Law Enforcement Officers Memorial Fund. Data compiled by the group found that 126 police officers were killed on duty in 2014, marking a 24 percent increase over last year. Police deaths due to firearms also increased 56 percent from 32 fatalities in 2013 to 50 in 2014. The report also found a rise in police officer fatalities due to ambush-style attacks. Fifteen officers were killed in ambush attacks—such as the recent murder of two police officers in Brooklyn—making them the leading killer of police officers who died in firearms-related incidents. “With the increasing number of ambush-style attacks against our officers, I am deeply concerned that a growing anti-government sentiment in America is influencing weak-minded individuals to launch violent assaults against the men and women working to enforce our laws and keep our nation safe,” Craig Floyd, chairman and CEO of the memorial fund, said in a statement.